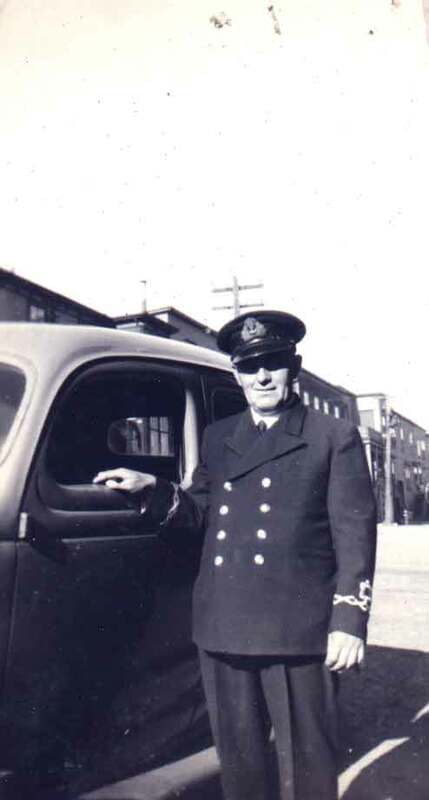 Captain Alfred John Sinclair, in uniform, taken on Water Street, 1944, age 50. Captain Alfred John Sinclair, Jack to his closest friends, was born in Upper Rocky Brook or Gin Cove Head (now part of Monroe), Smith Sound, Trinity Bay on 25 July 1894. He was the the fifth son and seventh child of Joseph and Christina (Stone) Sinclair. His siblings were Edward, William, Maud, Mary, Charles, Emanuel, Patience, Maxwell and Anastasia (Babe). The Sinclairs summer fished at Red Bay, Labrador, and operated a sawmill, started by his grandfather Charles Sinclair in 1871, at Monroe in the winter. Captain Sinclair made his first trip to Labrador in 1905, at 11 years old. He never returned to school, having finished Grade Three, but went on to obtain his Foreign Going Masters Ticket in 1913, when he was 19 years old. Self educated, he was an excellent navigator and sailed until 1946. During World War I he served in the Merchant Service as a Mate and Captain. He was torpedoed off Portugal and England three times in five days in 1916. After the War he returned to the salt fish trade making annual trips to the Mediterranean with salt fish and returning with salt and to the West Indies and the Caribbean bringing back rum, molasses, and sugar. He married Beatrice Mary Harding of Greenspond, Bonavista Bay, in 1921 and set up house on Gear Street, St.John's. He was the father of Donald (1924), Nina Marie (1926), and Ralph Edgar (1928). During a downturn in the fish trade in 1927, and after they were nearly lost with the Retraction in 1926, he and Max joined their brother WIlliam, a general building contractor, in Detroit, Michigan. He returned in 1930 as captain and owner of the Winnifred E. Lee, a two-masted schooner built in Baine Harbour, Placentia Bay. Max returned later, gave up the sea, and went on to be a Newfoundland construction foreman until he retired in the 1970's. Captain Sinclair retired from the schooner trade in 1936, when he sold the Winnifred E. Lee, to enter the Newfoundland Custom Service as Captain of the M.V. Shulamite, patrolling mostly on the South Coast of Newfoundland, a known area of smuggling operations into Canada, the United States, and Nerwfoundland from the French possessions St. Pierre and Miquelon. He took part in many official tours during these years including annual tours of Newfoundland and Labrador by the Governor and high ranking church officials. It was on one such trip, in 1937 that he was credited with winning the Battle of Bonne Bay. In late 1939, Captain Sinclair was seconded to the Royal Canadian Navy Reserve with the rank of Lieutenant Commander and posted to St. John's as a Navy pilot. He retired from active service in 1946. Captain Sinclair built a retirement home in Chamberlains, Conception Bay, in 1948, and took up boat building and finish carpentry. He built two 10 metre, Dragon class, sailboats for Robert Murphy and Robert Coleman between 1952 and 1954 and turned out a full range of smaller wooden boats. In 1995 Robert Murphy's sailboat was seen on the slips at Long Pond getting some replacement planks put in her hull. Robert Coleman's boat went adrift from her moorings in Conception Bay in 1959 and was wrecked near Topsail Beach. He was famous for the small plywood prams he turned out regularly as well as homemade water skis, furniture, and his detailed boat refurbishments. His boat building skills included cutting the timbers, knees, keels, and ribs he needed himself, carefully picking each tree. This attention to detail was also evident in his 1/50 scale model of the Retraction built from Honduras mahogany and teak. Each rigging block was made by hand; each piece of standing and running rigging was turned by hand using a small hand turned drill that he perfected. He sewed the sails himself and filed the anchors from blocks of copper. When he discovered he couldn't find the right sized chain for the anchors, he appropriated one of Beatrice's gold chain and installed it. The model sits in its oak and glass case at his son Don's house in Chamberlains. Captain Sinclair had a rare blood type (AB-) and he was often called on by St. John's hospitals to make direct transfusions; the call would come and off he'd go in an ambulance. In later life he developed geriatric diabetes and was put on a strict diet. No more salt beef fat (which he said he liked more than the meat); no more gravy; no more chicken skin. He was heard to mutter that one day he was going to get "a big piece of salt meat and a big, fat chicken, cook it all up, eat it all up, and go to hell on a full stomach". Captain Sinclair never believed man landed on the moon. He called himself "the biggest liar in Trinity Bay", which was borne out by his never-ending yarns about halibut nests and such. He soaked his feet in old leather boots filled with goose grease for the rheumatism in his ankles; he believed in the curative powers of burned transformer oil for arthritis; he could put away warts; he loved dogs and cats; he took Dodd's Kidney Pills and Carter's Little Liver Pills; and slept in flannel nightshirts. He died while taking an afternoon nap on 16 October 1971 at 77 years old. Beatrice died of complications of Alzheimer's disease 26 May 1972 at 77 years. Both are buried in the General Protestant Cemetery, Topsail Road, St. John's, alongside Beatrice's parents (Augustus and Mary Ann Harding), and their son Ralph, who died of congestive heart failure 17 April 1987.